A few months ago, I finally bought Ronni Lundy's mountain South cooking staple Shuck Beans, Stack Cakes, and Honest Fried Chicken, after hearing its praises sung for years. My friend Lora always said that when she first met her husband, she knew he was a keeper, because he had the cookbook on his shelf. I'm not sure what took me so long to acquire it, but I have a lot of catching up to do, just as Ronni is about to release another highly touted book, Victuals, due out at the end of the month. Faced with a glut of heirloom tomatoes, as one often is in the month of August, I went looking for a new tomato pie recipe, and reached first for Shuck Beans. The recipe, as Ronni says, is a traditional version of the Southern restaurant favorite stewed tomatoes, and as I say, is not to be confused with pizza, Philly/South New Jersey tomato pie, or for that matter, sweet green tomato pie. It bakes up easily with a simple top crust, and is an ideal side dish for a summer dinner on the porch. 1. In a medium bowl, whisk together flour and salt, then use fingers to work in the 2 Tablespoons of butter. Pour buttermilk into the flour mixture and stir until well blended but still damp. Turn out onto a floured board and roll into an 11-inch circle (or the size of your large cast-iron skillet). Cut into strips about an inch wide for the lattice top. 2. Preheat oven to 375 degrees F. Melt the Tablespoon of butter into a skillet. Add onions and cook until softened. Meanwhile, drain juice from the tomatoes and add milk to the juice. Whisk the sugar, cornstarch, and spices into the tomato juice and milk mixture until well blended. Pour into skillet and turn heat to medium. Add the tomatoes, cut into bite-sized pieces, and bring to a boil, stirring constantly. 3. Let the mixture boil for 1 minute, then remove from the heat and let cool slightly. 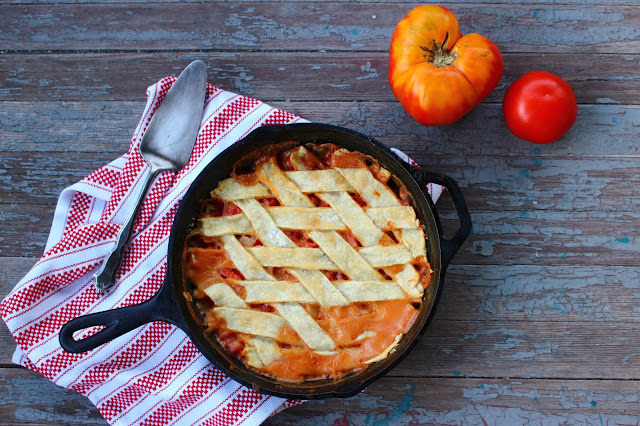 Lay the strips of dough over the top of the tomato mixture, weaving to make a lattice, if desired. The tomato mixture will bubble up through the strips to flavor them. 4. Place skillet in the oven and bake for 25 minutes until the dough is golden-brown. Enjoy as a side dish, perhaps with a salad and chicken or fish. yum, fresh tomatoes in pie this might be a new favorite around my house. I have loved your blog and all the delicious recipes. Is it okay to bake tomatoes in a cast iron skillet? I thought they were too acidic, but maybe that's when you're cooking on a stove top? Interesting-- I'd never heard that before! According to Food52 and The Kitchn, though, as long as your cast iron pan is well-seasoned, you should be okay.